Monthly Review | When Did the Anthropocene Begin…and Why Does It Matter? When Did the Anthropocene Begin…and Why Does It Matter? The word Anthropocene, unknown twenty years ago, now appears in the titles of three academic journals, dozens of books, and hundreds of academic papers, not to mention innumerable articles in newspapers, magazines, websites, and blogs. There are exhibitions about art in the Anthropocene, conferences about the humanities in the Anthropocene, and novels about love in the Anthropocene. There is even a heavy metal album called The Anthropocene Extinction. Rarely has a scientific term moved so quickly into wide acceptance and general use. In 1995, Paul Crutzen, then vice-chair of the International Geosphere-Biosphere Program (IGBP), received a Nobel Prize for showing that widely used chemicals were destroying the ozone layer in earth’s upper atmosphere, with potentially catastrophic effects for all life on Earth. In his Nobel acceptance speech, he said that his research on ozone had convinced him that the balance of forces on Earth had changed dramatically. It was now “utterly clear,” he said, “that human activities had grown so much that they could compete and interfere with natural processes.”3 Over the next five years that insight developed until, at an IGBP meeting in 2000, he argued that human activity had driven the earth into a new geological epoch, which he proposed to call the Anthropocene. A no-analogue state. Planetary terra incognita. Unprecedented and unsustainable. These phrases are not used lightly: the earth has entered a new epoch, one that is likely to continue changing in unpredictable and dangerous ways. This radical transformation was first extensively described by the IGBP in 2004, in Global Change and the Earth System, a broad synthesis of scientific knowledge about the state of our planet that remains the most authoritative book on the Anthropocene.5 Since then, a great deal of scientific discussion has focused on a question that book did not answer: When did the Anthropocene begin? Of course this has involved technical discussions among experts in various disciplines, but it is not just a technical question. Technical studies can determine when an asteroid hit our planet or when an ice age ended, but a discussion of when human society pushed the Earth system into a no-analogue state must address social, economic, and political issues. There is a reciprocal process here. Examining social, economic, and political developments can help identify social changes that might have changed the Earth system, and determining when radical physical changes in the Earth system happened provides a basis for determining which human activities were responsible, and thus what measures humans might take to prevent the change from reaching catastrophic proportions. In this article I offer an overview of the issues and stakes in the “when it happened” debate. Geologists divide the earth’s 4.5 billion year history into a hierarchy of time intervals—eons, eras, periods, epochs, and ages—called the Geological Time Scale. We live in the Quaternary Period, the most recent subdivision of the Cenozoic Era, which began 65 million years ago. The Quaternary in turn is divided into two epochs—the Pleistocene, which began 2.58 million years ago, and the Holocene, which started 11,700 years ago and runs to the present. The divisions are not arbitrary: they reflect major changes in the dominant conditions and forms of life on Earth. The Cenozoic Era is marked by the rise of mammals, following the mass extinction of dinosaurs and most other plants and animals at the end of the Mesozoic. The Pleistocene Epoch was characterized by the repeated expansions and contractions of continental ice sheets in the Northern hemisphere that are popularly called “ice ages.” The last glacial retreat marks the beginning of the Holocene, which has been characterized by a stable, relatively warm climate: all human history since shortly before the invention of agriculture has occurred in Holocene conditions. The AWG must also decide whether the Anthropocene should be accepted as a new epoch following the Holocene, or a new age within the Holocene. The former has been generally assumed so far, but the latter would be less controversial. At present, the Anthropocene Working Group includes some thirty-eight members from thirteen countries on five continents, all working as volunteers. About half are geologists; the rest have backgrounds in other earth sciences, archaeology, and history. They hope to make recommendations during the 35th International Geological Congress in South Africa in August 2016, but formalization of the Anthropocene is not a foregone conclusion. The recommendation might be that the term should remain informal, or that a decision should be delayed. If the AWG recommends formalization, the Geological Time Scale still will not be changed unless 60 percent majorities in the ICS and the IUGS agree. And in fact, a dozen or more proposals for dating the Anthropocene have been made to the AWG. While they differ substantially from each other, the starting dates under serious consideration fall into two broad groups that can be labelled Early and Recent, depending on whether the proposed starting date is in the distant past, or relatively close to the present. Other Early Anthropocene arguments suggest dating the Anthropocene from the first large-scale landscape modifications by humans, from the extinction of many large mammals in the late Pleistocene, from the formation of anthropogenic soils in Europe, or from the European invasions of the Americas in the 1500s. Some archeologists propose to extend the beginning of the Anthropocene back to the earliest surviving traces of human activity, which would take in much of the Pleistocene, and others have suggested that the entire Holocene should simply be renamed Anthropocene, since it is the period when settled human civilizations first developed. This outpouring of proposals reflects humanity’s long and complex relationships with the earth’s ecosystems—many of the proposed beginnings are significant turning points in those relationships, and deserve careful study. But the current discussion is not just about human impact: “the Anthropocene is not defined by the broadening impact of humans on the environment, but by active human interference in the processes that govern the geological evolution of the planet.”10 None of the Early Anthropocene options meet that standard, and none of them led to a qualitative break with Holocene conditions. 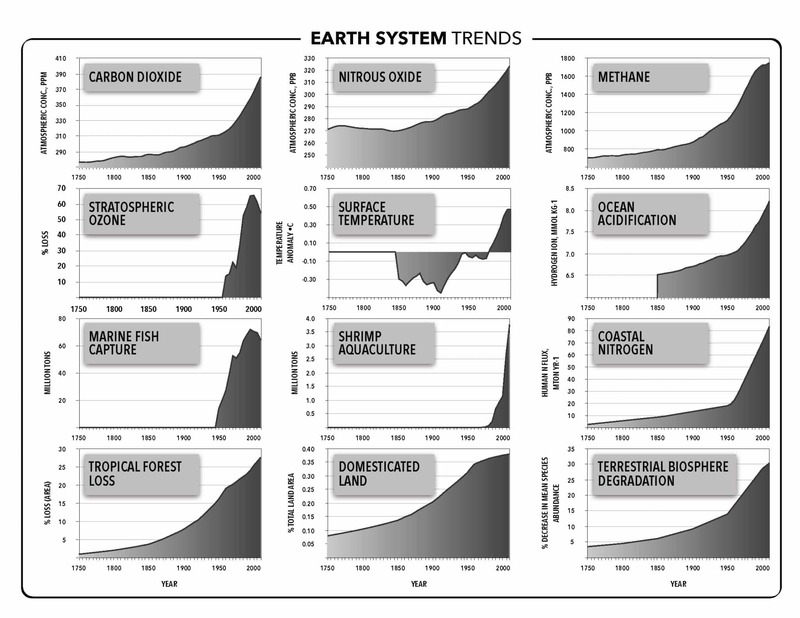 In 2007, in a journal article provocatively titled “The Anthropocene: Are Humans Now Overwhelming the Great Forces of Nature?,” Steffen, Crutzen, and McNeill republished the Great Acceleration graphs, and suggested that the second half of the twentieth century should be viewed as Stage 2 of the Anthropocene. Updated versions of the 2004 Great Acceleration graphs were prepared this year by the IGBP. As in the original graphs all the trend lines show hockey stick-shaped trajectories. Graphs based on the updated IGBP data are provided above and on the following page. 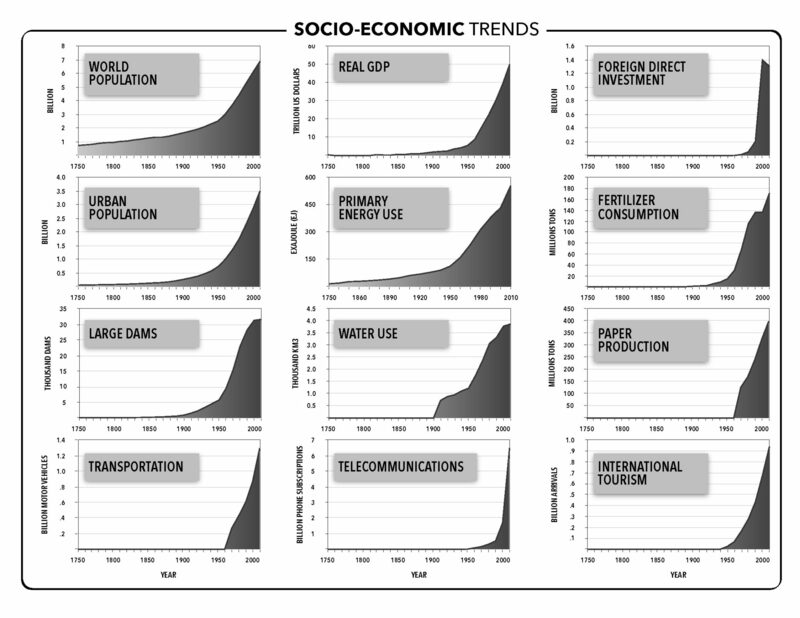 Notes: “Socio-Economic Trends” and “Earth System Trends” charts (above) created by R. Jamil Jonna based on data in Will Steffen, Wendy Broadgate, Lisa Deutsch, Owen Gaffney, and Cornelia Ludwig, “The Trajectory of the Anthropocene: The Great Acceleration,” Anthropocene Review 2, no. 1 (April 2015): 81–98. The three authors leave no doubt that their answer to the question in their title is an emphatic Yes. Since then, many Earth System scientists have come to view the Great Acceleration not as a second stage but as the actual beginning of the Anthropocene. In an article published in January 2015, over two-thirds of the Anthropocene Working Group’s members endorse 1945 as the beginning of the Anthropocene, because the Great Acceleration is a geological and social turning point, and because it can be located in geological strata by the presence of radiation from nuclear fallout. As an alternative to nuclear fallout as an indicator, other scientists have proposed using distinctive forms of soot from high-temperature coal combustion that started to appear in geological strata around the world in about 1950. There is also disagreement about whether the beginning of the Anthropocene should be located at the beginning or the peak of the fallout record from nuclear bomb tests—in 1945 or 1964. These and other technical issues remain to be resolved, and of course the AWG only makes recommendations: the final decision rests with the Commission to which it reports. In the past twenty years, science has taken a giant leap forward, combining new research in multiple disciplines to radically expand our knowledge and understanding of the Earth system as a whole. At the same time, ecosocialists have made huge strides in rediscovering and extending Marx’s view that capitalism creates an “irreparable rift in the interdependent process of social metabolism,” leading inevitably to ecological crises. These two developments have for the most part occurred separately—despite their mutual relevance, there has been little interchange between Earth system science and ecological Marxism. That has been particularly damaging for Earth system science, which now has a clear view of the physical, chemical, and biological threats to our world, but offers little insight into the underlying causes of the postwar explosion of environmentally destructive activity. Rather than carping from the sidelines about the scientists’ lack of social analysis, ecosocialists need to approach the Anthropocene project as an opportunity to unite an ecological Marxist analysis with the latest scientific research, in a new synthesis—a socio-ecological account of the origins, nature, and direction of the current crisis in the Earth system. Moving towards such a synthesis is an essential part of developing a program and strategy for twenty-first-century socialism: if we do not understand what is driving capitalism’s hell-bound train, we will not be able to stop it. No matter what happens in the formal geological decision process, that new epoch is now upon us. What we face is not just extensive pollution, not just rising temperatures, not just rising sea levels, but many centuries in which a safe operating space for humanity may no longer exist. That is why, in our time, understanding and responding to the Anthropocene must be at the top of the socialist agenda. This article is one of a series on aspects of the Anthropocene and its implications for ecosocialists and ecological Marxism. This is a new subject for the left, and the science is evolving rapidly, so my judgments are preliminary and subject to change. The articles will be posted at http://climateandcapitalism.com/category/anthropocene. I look forward to receiving comments and suggestions. ↩Will Steffen, Paul. J. Crutzen, and John R. McNeill, “The Anthropocene: Are Humans Now Overwhelming the Great Forces of Nature?,” Ambio 36, no. 8 (December 2007): 614. ↩Alexandre Costa, “Socialism Is Not Possible on a Ruined Planet,” Climate & Capitalism , April 17, 2014, http://climateandcapitalism.com. ↩Paul J. Crutzen. “My Life With O3, NOx And Other YZOxs,” Nobel Prize lecture, December 8, 1995, http://nobelprize.org. ↩Paul J. Crutzen and Will Steffen, “How Long Have We Been In The Anthropocene Era? An Editorial Comment,” Climatic Change 61 (2003): 253. ↩W. Steffen, et al., Global Change and the Earth System : A Planet Under Pressure (Berlin: Springer 2004), 258–59, http://igbp.net. ↩The requirements for formally defining a new geological interval, and issues that are specific to this case, are discussed in several essays in C.N. Waters, et al., eds., A Stratigraphical Basis for the Anthropocene (London: Geological Society, 2014). ↩Paul J. Crutzen, “Geology of Mankind,” Nature 415, no. 23 (January 3, 2002): 23; Paul J. Crutzen and Eugene F. Stoermer, “The Anthropocene,” Global Change Newsletter , no. 41, May 2000, 17, http://igbp.net. ↩William F. Ruddiman, “The Anthropogenic Greenhouse Era Began Thousands of Years Ago,” Climatic Change no. 61, December 2003, 261–93. William F. Ruddiman, “How Did Humans First Alter Global Climate?,” Scientific American no. 292 March 2005, 46–53. ↩Clive Hamilton, “Can Humans Survive the Anthropocene?,” originally May 2014, http://rampages.us. ↩James Hansen, et al. “Ice Melt, Sea Level Rise and Superstorms,” Atmospheric Chemistry and Physics 15 (July 2015), http://columbia.edu. ↩Ted Nordhaus, Michael Shellenberger, and Jenna Mukuno, “Ecomodernism and the Anthropocene: Humanity as a Force for Good,” Breakthrough Journal , Summer 2015, http://thebreakthrough.org. For a discussion of the reactionary role of the Breakthrough Institute in Anthropocene discussions, see Ian Angus, “Hijacking the Anthropocene,” Climate & Capitalism , May 19, 2015, http://climateandcapitalism.com. ↩Clive Hamilton and Jacques Grinevald, “Was the Anthropocene Anticipated?,” Anthropocene Review 2, no. 1 (April 2015): 59–72. ↩Will Steffen, et al., Global Change and the Earth System , 132, 133, 258–60. ↩Will Steffen, et al., “The Trajectory of the Anthropocene: The Great Acceleration,” Anthropocene Review 2, no.1 (April 2015): 81–98. ↩Steffen, Crutzen, and McNeill, “The Anthropocene: Are Humans Now Overwhelming the Great Forces of Nature?,” 617. ↩Jan Zalasiewicz, et al., “When Did the Anthropocene Begin? A Mid-Twentieth Century Boundary Level Is Stratigraphically Optimal,” Quaternary International , January 2015 (in press), http://sciencedirect.com. ↩Ian Angus, “Barry Commoner and the Great Acceleration,” Climate & Capitalism , June 29, 2014, http://climateandcapitalism.com. ↩John Bellamy Foster, The Vulnerable Planet (New York: Monthly Review Press, 1994), 109. ↩In most cases, this “it’s just capitalism” view is implicit, not formally defended, but some people do argue that the birth of capitalism and the end of the Holocene were one process. This leaves the qualitative global change of the mid-twentieth century unexplained. ↩Will Steffen, et al., “The Trajectory of the Anthropocene,” 82. ↩John Bellamy Foster, “Foreword,” in Paul Burkett, Marx and Nature: A Red and Green Perspective (Chicago: Haymarket Books: 2014), xii. ↩Will Steffen, et al., “The Anthropocene: From Global Change to Planetary Stewardship,” Ambio 40, no.7 (October 2011): 739—61.